I don’t know about you, but I love salads, especially those that can make you forget about the main dish! 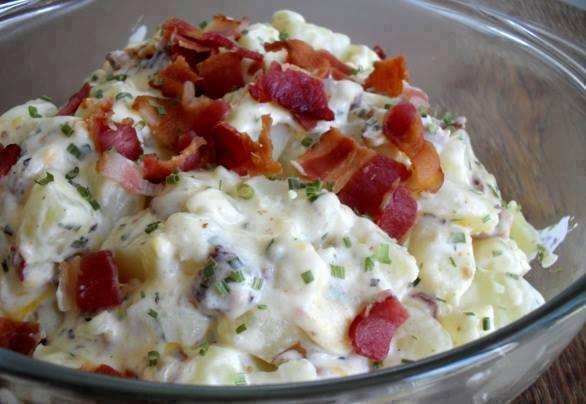 This loaded baked potato salad is just amazing, check it out! 1 package of cooked and crumbled bacon. First wash and cut the potatoes to bite sized pieces then cover with water and boil to cook for about 20 to 25 minutes then drain and cool. In a bowl, mix together the mayonnaise and sour cream and add in the onions, chives, cheese, salt and pepper and mix with the cooled potatoes. Top with extra shredded cheese and bacon before serving. Easy, peasy and cheesy! This loaded baked potato salad is a must-try guys! It’s so delicious, you won’t get enough of it!